I know, I know, it sounds gross but actually it is very good. If you like chocolate and mint you will absolutely love this pie. Grasshopper Pie is basically an Oreo crust with a chocolate pudding, mint mousse, whipped cream, and garnish--a great blend of textures and flavors, and the airy mint mousse is very refreshing, so it goes great after a big meal. I often make it around Christmas time, mostly per my mom's request. This year my sister was visiting over the holidays and took lots of pictures while I baked. I originally got this recipe from the Creative Cook's Kitchen, but as usual I have made a few changes. I have not converted this recipe yet to weight and tested it so after the jump is the recipe in cups with lots of pictures to guide you through it. For my suitcase cake, I had to make a dog for the top of the cake. Since it was my first time making one, I chose to make it out of fondant since it takes longer to dry out (compared to gum paste or modeling chocolate) which gave me time to fix mistakes. Another option would have been to make it out of a 50/50 mix of fondant and gum paste. First I started out with a picture of the dog printed out large so I could see all of the details. I kept this photo handy through the whole process. Since the dog was mostly white, I started off with a large round ball of white fondant. From there I started rolling it in my hands to make it longer and more narrow. I then, started to pull out the head, feet and tail. I also trimmed down the back of the dog since he was looking a bit fat. In the picture I am using a fondant tool to pull and work out the top leg. Once I had the dog the shape I wanted I started to add color. First his spots and then his nose and collar. Eyes and ears were also added at this time. The last step was to add the pads on the bottom of the dogs feet. Once this was done, I placed him on the top of the cake and made his favorite ball to put between his front legs by rolling a ball of blue fondant (which you can in the first picture, up top). And tada, cute fondant dog that our friends absolutely loved! A good friend of ours asked me to make the cake for his 30th birthday party. He wanted it to reflect his personality and interests. He gave me a list of all the things he likes and wanted represented on the cake (he sent me emails of all the logos/symbols he wanted included). Since it was such a jumble of unrelated things, I gave him three options on how I thought we could incorporate them onto the cake and have it still look cohesive. First, I could make a basic sheet cake and just cover it will symbols of all his favorite things. Second, I could go with a tiered cake and make each tier a different theme to represent his likes. Third (and the one we went with) was to make a cake shaped like a suitcase and put all his favorite things on like stickers all over the suitcase. He also wanted a figure of his dog on top. It was a big order for me and I was really excited to try it. I had never made a carved cake like that or a figure of a dog, so not only was it a large cake but it had some new challenges for me in it too! Laurie's comments are in blue, her lessons learned are in green, and Dan's comments are in black. 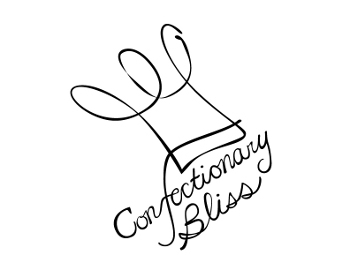 Confectionary Bliss is Laurie and Dan Shapiro's home kitchen, located in Perkasie PA, making special occasion cakes, custom cakes, cupcakes, pies, and other desserts for friends and family in areas such as East Norriton, Allentown, Souderton, Warminster, Plymouth Meeting, Norristown, King of Prussia, Blue Bell, Philadelphia, Bucks County, Montgomery County, and other nearby areas.